MomSelect's MommyParties division has been very kind to 3Po and Jammy and their friends in recent years; we have had the fortune of hosting a Hexbug Nano party in the fall of 2010, as well as a second Hexbug party last October, and my twins and their friends have all been thrilled with those little robotic bugs that scurry along a customizable track. This week it was The Pea's turn to have some fun with her friends, because MommyParties sent us a Bobble Bots Moshi Monsters Bash Kit so we could host our very own party. FYI, Bobble Bots are a lot like Hexbugs (in fact, they're made by the creators of HexBugs!) -- they are tiny collectible robots that move around by vibrating. They're based on the Moshi Monsters characters that are wildy popular with kids in the UK. Instead of plastic tracks, Bobble Bots Moshi Monsters travel around playsets that look like the houses, buildings, yards and streets of Monstro City. Kids can snap the playsets together in any configuration they want, so the Moshi Monsters Bobble Bots can wander in and out of the Gross-ery Store, Ice Scream Store, Moshi Monster House and more. The kids were so excited when a huge box arrived from Moshi Monsters Bobble Bots! It was packed with fun stuff for the party like Bobble Bots Moshi Monsters Moshlings (the little vibrating robots), Starter Sets (small interlocking playsets) and Stores (larger interlocking playsets), as well as ideas for activities, food and games. There was 1 Moshling for each guest to take home, but the guests had to work a little bit to earn them! I removed each Moshling from its packaging and placed it in a plastic Easter Egg, then hid the eggs around our back yard. When all the girls arrived, we had a little Easter Egg hunt, and they got to keep the Moshling they found in their egg. Each Moshling is super-cute, so after a bit of bartering and trading, everyone ended up with a Moshling they loved. The girls were quite content to spend all their time playing, but I managed to squeeze in a short game from the party activities suggestion sheet: Monstro City Races. It was super easy: I had everyone build Monstro City by snapping together all the sets and stores that came in the party box. Then each girl put their Moshling on one end of the City and turned them on. The Moshlings vibrated around, and the Moshling that got to the other end of Monstro City first was the winner! 1) Pop popcorn as directed on package, set aside in medium bowl. 2) Melt candy melts as directed on the package. 3) Dip one end of pretzels into melted candy melts and sprinkle with nonpareils. 4) Place pretzels on wax paper in the freezer to cool for 5-10 minutes. 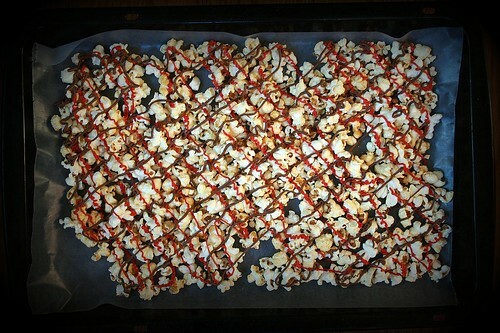 5) Drizzle left over candy melts over the popcorn and mix together with a rubber spatula until popcorn is coated. 6) Serve popcorn and pretzel mix in individual cups or paper cones. 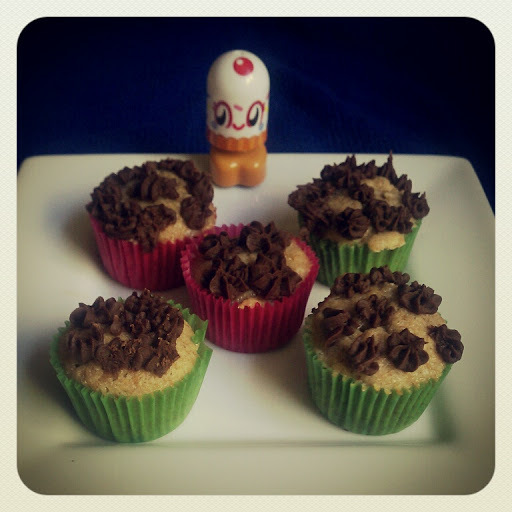 Of course, no party of ours would be complete without cupcakes, and since these Bobble Bots Moshi Monsters are so small, only the teeniest cupcakes would do. Everyone had a great time, and all the guests loved their Bobble Bots Moshi Monsters, as I knew they would. And because The Pea did such a great job of hosting the party (and because she just celebrated her 11th birthday! 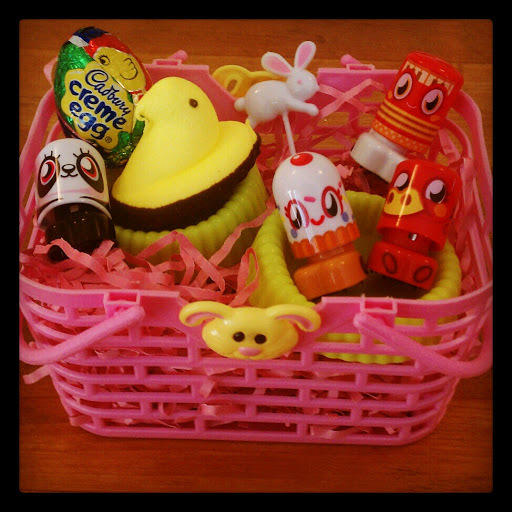 ), I treated her to a few more Bobble Bots Moshi Monsters in her Easter basket. Thanks, MommyParties and MomSelect, for introducing us to such a fun new toy! 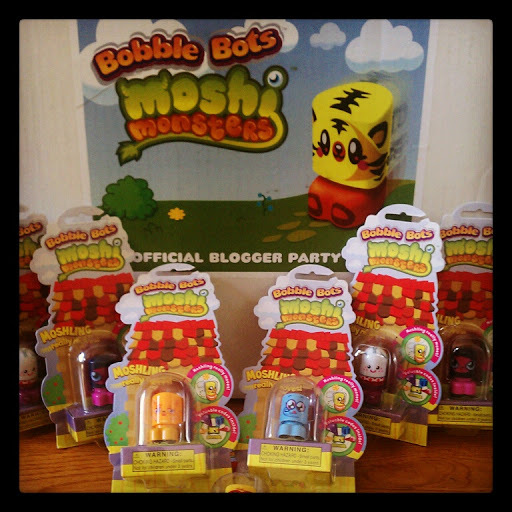 Disclosure: I received a Bobble Bots Moshi Monsters party kit courtesy of MomSelect/MommyParties. The views and opinions expressed here are my own.